The CARE Award honors nurses who work to improve health and wellness in the community. We’re proud that one of our own registered nurses, Francis Cunningham, won the CARE Award in 2018. 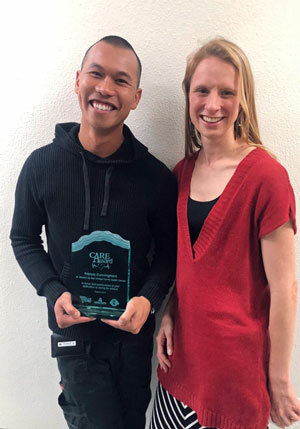 Francis poses with his CARE Award. Recently, KyXy 96.5, Azusa Pacific University‘s Nursing programs and Hotel del Coronado teamed up to acknowledge San Diego nurses for all of their hard work. They created the CARE Award rewarding deserving recipients with plaques and 50-minute spa treatments, courtesy of Spa at The Del. In November, Father Joe’s Villages’ own Dr. Sarah Carreira nominated one of our amazing Registered Nurses providing health care to neighbors in need: Francis Cunningham. Due to his passion for serving others and compassion for patients, Francis won! Francis served as a Registered Nurse with the Augustinian Volunteer Corps at the Village Family Health Clinic for 10 months in 2015 and 2016. After his service ended, he returned home only to move back to San Diego to work once again for the health center. Thank you Francis and all of our nurses for your life-saving work! If you would like to join our team as a nurse for Father Joe’s Villages, we offer a variety of nursing positions, including jobs for registered nurses. Click here to learn more.